- What are the main differences from a hotel? · The apartments offer more space than hotel rooms. · You do not have to ask for the key at reception each time you enter in the apartment. · Ability to accommodate the whole family in one single apartment. · Allows you to experience the city from the perspective of a local person. - There is a 24h reception? Is there breakfast included? It is cheaper than a hotel? Is it less secure? We do not have a 24 hours reception, but you have a phone number where you can always call. There is no breakfast, but the apartments are fully equipped so you can prepare breakfast just the way you like. You also have great cafes nearby to have breakfast. The price is very similar to a hotel room with the same comfort and similar location. Undoubtedly, the apartments with a higher capacity are much less expensive compared to the hotel and can accommodate up to 6 people instead of 3 double bedrooms. Security is one of our major objectives, that is why all our buildings have video surveillance cameras and security doors. - Are there neighbours in the building? The three buildings we manage are exclusively dedicated to vacation rentals. Our vacation rental apartments do not coexist with long-term renters in the same building. - The apartments we offer are ours? We do not own the buildings but we have been granted the exclusive exploitation license. - How to guarantee the quality of our apartments? We have established a method to ensure that everything has been thoroughly checked before our clients enter in the apartment. Our cleaning team is responsible for giving notice when they detect any damage so it can be fixed as soon as possible. We also give transparent and honest information, so you do not have surprises the arrival day. - The apartments are separated in different buildings? The apartments are located in 3 different buildings in the best areas of Barcelona. - Can I visit the apartment before you book it? There is no problem, the apartments can be visited at any time as long as they are not occupied by other customers. You only have to contact us and we will gladly show you the apartment that might find more interesting. - What is the minimum and maximum number of nights that I can stay? Our policy states a minimum of 2 nights booking. As maximum, we offer rentals of 2 months, but each case can be studied. - If the apartment is listed as available, is it available? If the apartment is listed as available on our website it can be booked directly from the page. Our online calendar is always updated in real time. - Can I make a reservation by phone or mail? The most comfortable is the online booking, as the apartment is reserved from that moment. In any case, of course you can book by e-mail or phone call. - When I make a reservation from the website, the apartment is already booked? Once the booking is made and paid the 25% of the total amount of the reservation, the apartment is yours and no longer appear as available to other potential clients. - I travel with children. How should I include in the reserve? At the time of booking you must not take into account children under 5 years as they counted in the price of the room. But it is important to let us know how many they are, to make the beds and include towels! - I receive confirmation of the booking? You will receive the booking confirmation by e-mail, please note that until you have done the payment of the 25% of the reservation, the apartment is not fully confirmed. - Do I have to pay when I make the reservation? How do I pay? At the time of booking, the system will ask to make the payment of the 25% of total stay with which the reservation is fully guaranteed. Payment can be done by credit card or bank transfer. - It is safe to use my credit card to make my reservation? The credit card information is not requested until the online system links you to the secure website of our bank (La Caixa). Note that a connection is made via secure server (https). Furthermore, we respect and follow all protocols established by the Data Protection Act to ensure that your information will not be disclosed to third parties under any circumstances. - When is the rest of the payment done? How can I pay it? The remaining amount of the booking is paid upon arrival by credit card or cash. For the payment of the 25% when booking online, we accept Visa and MasterCard. For the payment on arrival, Visa, MasterCard and American Express. - Do I receive a bill or invoice? Once paid 100% of the reservation we will give you the bill of the stay. We can also make an invoice that you will receive by e-mail in PDF format. If you need an invoice at the end of the stay, kindly indicate it to us on arrival, and the information in case of wanting it a different name. - What is included in the total price of the reservation? The final price of the reservation includes tax, final cleaning, linen and towels, consumptions and Internet access. - What is not included in the price? The price does not include parking, daily cleaning, breakfast or other additional services. - I do not understand how to construct the price. - The price I see in the rates table of the apartment does not match when I want to book. Why? The price displayed on the rate table is the price to stay today. It is possible that you are selecting dates are in a different season in which the cost of the night is different. - Discounts are available for longer stays? Yes, we apply discounts for longer stays. For stays between 7 and 13 nights, you have to apply a 14% discount on daily rate. For 14-20 nights the discount increases to 20%. For stays of 21-27 nights the discount would rise up to 23.75% and for stays of 28-34 nights discount goes up to 26.25%. - Do we have group discounts? For groups there are special discounts. Applied by adding the total number of nights booked by the group and correspond to those mentioned above for long stays. - From what age do children pay? Children pay if they are more than 5 years. It is important to report the number of children under 5 years, although not included in the price, so that we can make the beds and put the corresponding towels. - I think it is expensive. First you must calculate the cost of hotel rooms that you are going to book depending on how many people you are going to travel. Another aspect to take into account when estimating the cost of staying is the money spent in lunches and dinners in restaurants. The apartments have fully equipped kitchens to prepare meals and dinners for the whole family. - How can I cancel or amend the booking? If you want to cancel or amend your booking you should contact us. - Which is the cancellation policy? You can find the cancellation policy in the "About Us> Terms and conditions" section of our website. - What if I can not travel because of an illness? If, by reason of illness, you can not travel, we will have to apply the cancellation policy. That is why we recommend purchasing a travel insurance. You can contract a travel insurance going into the "About Us> Terms" section on our website. - Are not much stricter conditions than in a hotel? You should take into account that a hotel, because of the number of rooms and volume of reserves, has a big capacity to fill the rooms released for cancellations. We do not have this ability and that is why we ask for a greater commitment from our customers. - Do I have to send my arrival information 2 weeks before? We need to know your arrival information to organize the team and ensure that no client will be waiting at the door of the building upon arrival. - Do I have to be mandatory reachable in a mobile phone? It is not mandatory, but is the only way we have to contact clients when necessary. - If I have no phone, how do I call? In Barcelona there are public phones from which you can call us. If calling from a local phone you do not have to include the prefix "+ 34". - What happens if I do not advise about my arrival? If the team does not have any arrival information, we will not be waiting in the apartment. If the advice of arrival is done at the door of the building, it can take 15 minutes for us to get there. That is why we ask this information! - Do you pick me up at the airport? We can contact a company that would send a driver to collect you at the Hall of the airport and take you to the apartments. - How can I get to the apartments? There are different modes of transport. We recommend you to look on our website how to get to your apartment. You can find it in "Location> Arrival info." You must choose the building where the apartment that you have booked is located. - What transportation is the most recommended? The fastest and more comfortable transport is the taxi. - The taxi is not very expensive? The taxi will cost approximately 40 EUR. You should take into account that if you are 4 people, the cost of the Aerobus tickets (5 EUR) plus the metro tickets (2 EUR) would be very similar to what we spend per person in a taxi. - Where do I have to go when I arrive to Barcelona? What is the address of the apartment? When you arrive to the city, you have to go directly to the apartments where we will give you the keys and all the tourist information you need. If you are planning to make a stop to eat, you must advise us so the staff person receiving you will not be waiting in vain. The address of the apartment is written on the booking or in the section "Buildings" in our website. You must choose the building where the apartment that you have bookd is located. - There will be someone to meet me? If you have supplied the information before arrival, of course someone will be waiting you upon arrival. - At what time can I check-in? I can get earlier? The time of entry to the apartments is from 15:00. Anyway, you can come before 15:00, we will try to give you access to the apartment as soon as possible. - If I can not access the apartment, what to do with the bags in the meantime? You can leave the luggage stored in the locker of the building or inside the apartment while the cleaning crew finished cleaning. - Is there a charge to check in at night? With no 24-hour reception, the person who receives you explicitly moves from home to help you. After 20h, check in has an extra cost of EUR 25 EUR. After 24h, 50 EUR. - Do I have to pay the stay at check in? We try to make everything as easy as possible. If the booking is paid on arrival, you do not have to worry anymore. On leaving you only have to leave the keys on the table of the apartment and close the door. - The deposit is refundable at 100%? How is paid? The deposit is 100% refundable if the apartment has not suffered any damage. - There is internet connection? It is wireless? Is it Free? All apartments are equipped with free wireless connection. - The apartments have TV, CD player and telephone? All apartments have a TV LCD 32'' and those in the building of Passeig de Gracia also have a home cinema with which you can also play CD's. In the apartments there is no phone. - The apartments are supplied with towels and sheets? The apartments are provided with sheets and towels for all the people included in the reservation. - The bathroom is shared? Each apartment has at least one complete own bathroom. It is not shared with any other guest in the building. - Is there a kitchen? It is equipped with dishes and glasses? There are pots and pans? - Tap water is drinkable? In Barcelona tap water is potable and can be drunk safely. - Is there a parking? In the buildings of Passeig de Gracia and Virreina there is an underground parking where you can park your car. This service has an additional cost of 25 EUR per night and can be booked in advance. - What is the electricity power, and how are the plugs? Do you have adapters? The voltage in Spain is 220V. Plugs have two round pins, and are common in France, Italy, Germany, etc.. If needed, we can provide an adapter. - During the stay, who to call if I have a problem? If you have problems you have to call the number in the card given on arrival. - What happens if I break something? If you break something of the apartment, you must advise so we can repair it. In case of a malfunction caused by clients misuse it will have to be deducted from the deposit. - Where do I leave the trash? What time? Do we have to recycle? Trash should be disposed in the containers located in front of buildings or in the nearest corners. Trash can be deposited at any time. You will find recycling bins differentiated by universal colours. We encourage you to use them. - Is there a daily cleaning of the apartment? The cleaning of the apartments is not done daily but is done at the end of the stay. For stays over one week, there will be weekly cleanings. - Can I invite people to my apartment? Your apartment is your home, you can invite anyone you want. But keep in mind that you do so at your own risk. What is not permitted is to include more people than the ones indicated on the reservation. - Can you arrange transfers for groups? We can arrange airport pickup for groups. You must call us in advance to make reservation of the vehicles. - May we all be on the same floor? If possible, we can place the apartments booked on the same floor. - We come to celebrate a bachelor party. Can you organize activities? You have to take into account that parties are not allowed in the apartments. However, if you indicate the type of activities you wish to do, we can manage the reservations so you do not have to worry about anything. - Are children allowed in the apartments? Of course children are welcome. - The apartments are quiet? All buildings are located in quiet areas where local people live. - Are the areas of the buildings suitable for children? They are totally appropriate, there are children's facilities very close. - Baby cots are available? Do I have to pay anything? Cots, highchairs and small plastic tubs that can be reserved free of charge. - Can you make the invoice to a company name? The invoice is sent by email in PDF format. If you want an invoice you should indicate to us on arrival. If you want us to do it on another name, or the company name, you have to provide the information needed to process it. - Do you make special rates for business? We apply discounts to companies that have chosen us to accommodate their staff. - Are the apartments suitable for executives? The apartments have everything needed for an executive to work without any problems. - Do you have a desk to work? We have apartments with working desk, tell us your requirements so we can recommend you and help you to make the best choice. - Are the apartments adapted for the disabled? If you have a disability or travel with someone disabled, please contact us so we can advise you. We prefer to give the measures of the apartments to be you who decides if the apartments are suitable or not. - Do buildings have elevators? All buildings are equipped with elevator. - Do you have equipment for disabled? In buildings of Passeig de Gracia and Virreina, access is adapted for the handicapped. The elevators have sufficient measures to introduce a wheelchair. In some apartments small pets are allowed with prior advice, in others not. Please contact us to tell whether animals are accepted in the desired apartment. - Do I have to pay any extras? Why? If you come with an animal will be required a deposit for possible damage caused. This deposit will be returned on departure after checking that the apartment is in good condition. - Smoking is allowed in the apartments? Smoking is strictly forbidden in apartments. - Are there apartments for smokers? In none of the apartments we manage smoking is allowed. - Can I smoke on the terraces? Smoking is permitted in common roof terraces of the buildings or on the terraces of the apartments. - What services are in the area? All apartments are located in very commercial areas business in which you will find supermarkets, cafes, pharmacies, restaurants and all necessary services. - Is a quiet area? The areas in which the apartments are located are quiet areas and highly valued both by customers and by locals. - Are the apartments safe? Security is one of our priorities. The buildings are equipped with video surveillance system and security doors. - Are the apartments in safe areas? Despite being equipped with security systems, the apartments are located in very safe areas during day and also at night. - Do they have a safe? The apartments in the building on Passeig de Gracia have safe boxes. - What additional services can you offer? Additional services we offer are the rental driver, tour guide, rent bikes or scooters, taxi bookings, restaurant reservations, etc.. Contact us to know more. - What time do I have to leave? Can I stay longer? The check-out is at 11:00. If you need to leave later, we can check if you can keep the apartment some more hours. This depend if there is a client arriving the same day. - If I can not stay in the apartment, can I leave my luggage somewhere? In case we can not offer you to keep the apartment, we can offer a locker in which you can leave your luggage stored and locked until the time you need. - Do I have to clean the apartment? You do not have to clean the apartment, but we will thank you if it is left in a reasonable state. It is important to turn off the lights, air conditioning and throw garbage in the container. - Can I order a taxi for the day of departure? No problem we can book a taxi, that would buzz you intercom at the time you want. You must let us know with a time of advance so we can call the company. - How can I generate reviews of the apartment? Are they genuine? 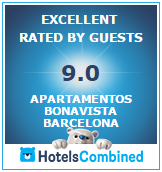 The reviews can be written on our website, the page where you found our apartments or in Trip Advisor. All comments about us are completely genuine and written by real customers. - How can I give my opinion after my stay? You just have to enter in our website, go to "Testimonials" and write the review. - Do you have office hours? We can be reached by e-mail, phone or Skype. Find all the contact information on the "Contact" section in our website.